This is my current “go everywhere with me” ideas notebook that many people will tell writers they must have. It’s been around the block more than a few times. Or to be more accurate it has been in my pocket(s) more than a few times. It’s quite distressed. It’s possible I will need a new one before too long. Yet all of its pages are not full. Yes, even after having this particular notebook for several years, it is not yet packed with ideas, character sketches, blog ideas or one-off stanzas looking for a poem to call home. There are ideas written in it, don’t get me wrong. Three kinds, in fact. 1) Ideas I have come up with and used since. 2) Ideas waiting to be used. 3) Ideas I have since lost interest in and will probably not use. -I tend to work almost right away on something that has struck me deep. It doesn’t happen all the time, but if one of those great ideas writers hope for grabs me, I will write it down in said notebook, finish the next stage in a current project, and than start the preliminaries on the new idea. Put another way, if an idea inspires me that much, I usually find a way to start working on it in short order, and hence having it in the notebook seems almost redundant. If I’m walking at noon and a great short story idea hits me, chances are I am writing something about it later that day or the following day. A writer cannot always wait for lightning strike inspiration, and I don’t. But when I do have it, I tend to get on with it. -I only tend to write down the more complete concepts as opposed to snippets. That little notebook and several others may in fact be full by now if I wrote down a few more things. There’s a hell of a lot inside this distracted globe. Is it meet I set it all down? My standard for what to write down in it is sometimes pretty high. Usually I will write something down if I have an idea of a main character and the central theme/conflict. Only once in a while do I write down a piece of dialogue that appears, waiting to be assigned to an unknown future piece. The image of a character or a building outside of a plot comes to me sometimes, but if I don’t know the context for same, I don’t usually put it in the notebook. Like I feel there is some sacred responsibility to only put down the most promising, most complete ideas, and avoid writing down ideas that will never materialize. As though I paid more than a dollar for this little thing, and need to economize or something. -My memory is pretty good. I know those are famous last words, and I have sometimes neglected to write down an idea only to have it slip away later. This is more common with my non-fiction though. -I internalize. I experience things, people, events, feelings, memories. They meld together to form a part of my creative psyche that remains in flux and yet serves as a relative constant which informs my work. A homogeneous mixture of potential tones, themes and moods. Those little snippet ideas sort of get sucked into this artistic maelstrom. They become part of a collective outlook within my soul that is reflected on the whole through my writing. Like mixing paints to form a specific base color, I suppose. I allow the constituent parts to blend into one, and then paint the canvass with that. -Tiny bit of self-consciousness. What do people think of the guy that stops what he’s doing and writes something down in a beat up little mini-composition book? I do it anyway, don’t misunderstand, but would I do it more often if I didn’t care that people would see me doing it half a dozen times in one afternoon? This, I grant you, is the weakest of all the reasons, and doesn’t always apply. But it’s there sometimes. These are the conditions under which I operate naturally. They aren’t rules I must follow, and I’ve been thinking it may be time to be a bit more liberal with what I record in said notebook. I don’t mean to suggest that I or any of you abandon what works. Do not by any means start keeping a notebook with you just because conventional wisdom says you should. 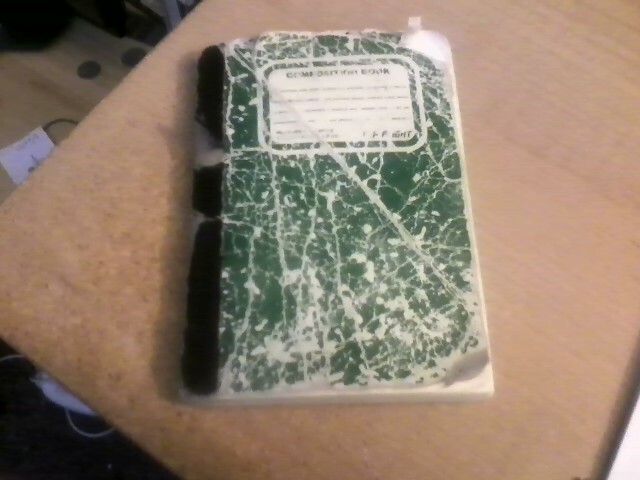 Nor should you feel pressured to fill a notebook, like mine, that is still half empty. Stay true to your own process, as will I. I am merely exploring the possibility of opening my process a bit more. If writing down more ideas more freely doesn’t feel right, I won’t keep doing it. But it may just make me feel more and not less tuned into inspiration or the Muses. Maybe. I’m not going to force anything, but I want to see what happens if I approach it differently. Do you keep an ideas notebook on you? How do you use it? Let me know in the comments.